Yesterday was a great day. I spent the day talking with my students about their writing. This is what I live for, but I am constantly discovering that many of my colleagues struggle with the writing conference and some even dread it. Writing conferences are a staple of the writing workshop classroom and something the National Writing Project encourages and supports, but they are tricky if you don’t have good personal experience to guide you. I am surprised after more than two years of steady blogging that I have not written much about conferencing and, in fact, have only mentioned it in passing a handful of times. But today I am going to share seven tips to improve writing conferences in your classroom in hopes that you, and your students, will learn to love writing conferences, too. As I noted in my introduction, one reason for struggling with these conversations is simply not having enough experience with the writing conference, so the first tip is to get some. Take your own writing and meet with some other writing teachers to discuss it. There is nothing like experiencing it for real to really understand how the writer feels in a conference and to learn what is useful and inspirational and, more important, what is not. Perhaps the most important lesson the National Writing Project taught me about the writing conference is to let the writer set the agenda for the conference. Ask them to prepare for the conference by considering the state of the work (is it still under construction, is the foundation/framework solid, is it ready for a polish and shine – or whatever metaphor works for you – this is actually a great class conversation to have about the writing process). Their preparation should also include a very short list of specific troubles or challenges they are facing with this project. This makes your job easy because you are now simply responding to their needs. Ask questions. Ask lots of questions. Ask about their idea, their thesis, their structure, their sources, or whatever your class is focusing on at that time. But don’t machine gun your questions. Give them time to fumble through their words and ideas. Sometimes their ideas aren’t as fully formed as you might like, but give them the time and space to talk their way to an answer. Do not treat this like a quiz. Remember, this is a conversation, a coaching session, not an assessment. Sometimes, when they are struggling to explain their idea or thesis I like to write down some key points they are making and then share back what I have and then we use that as the starting point for our work. My church choir director has this mean little trick he likes to play on us. Every so often he will make us sing acapella. While I’m not a big fan as a singer, as a writing teacher I find that I do something very similar. I like to make my students put their paper down, or close the screen, at the beginning of the conference. I then have them talk me through their paper just from memory. This is a great way to see organization and development problems as well as identify concepts they still need to think through more fully. I know that all writers fall in love with their words and ideas. Picking out the fluff and filler is often challenging for even the most experienced writer and suggesting that someone’s prized anecdote or quote is unnecessary can be considered fightin’ words in some circles. So I like to try various techniques to help them find these fluffy bunnies on their own. Some of my favorite techniques are making my students outline their project using six-word stories or sometimes even tanka poems. I like using a strategy with a tight word count because it forces them to think carefully about each idea rather than the specific turn of phrase. I also use this strategy before they begin writing to help them organize their thoughts. I like to give my students writing prompts before we have a conversation about their project. These prompts typically match where we are in the process (as a class) so they are ready to answer my questions and we can begin the conversation in the same book if not on the same page. I often will tailor these prompts to an expected trouble spot. For example, this week I asked my students to share a specific anecdote (based on the source material they have already been working with so this is not pulled from thin air) to support their argument. They did this without the source material in front of them so it was in their own words with no danger of text hugging, and then we were able to use their own text to support my mini lesson about in-text citation. Once upon a time I liked to schedule individual writing conferences in my office. While these were fantastic, time constraints make it extremely difficult to do many in a semester which does not give the level of intervention most developing writers need, and so, now, I tend to default to the mini in-class conference. One of my favorite strategies is the group conversation to set up the individual mini conference. Using any combination of the above strategies, I will group students (I almost always group them myself based on various criteria dependent on the goals of that specific class session) and give them a specific task. I then float from group to group. This allows me to do a quick spot check for whatever specific checkpoint I have set and usually the group will be able to identify questions or challenges we should address in a mini lesson or have begun work on individual questions or challenges. Sometimes they need my coaching and guidance, but the more experienced they become with this format the more likely they are to leverage the power of their collective experience and knowledge so I am not needed. These group conversations also provide a model for when they work together in pairs and groups in workshop without me. 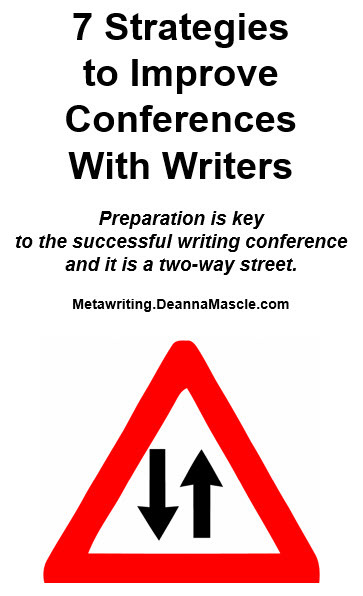 Preparation is key to the successful writing conference and it is a two-way street. Not only does the instructor need to be prepared, but so does the writer. Conferencing can be a heavy burden if you work at it alone, but together you can accomplish so much more. What are your strategies for a successful writing conference? Do you conference with your writers? What challenges do you encounter when you conduct writing conferences in your classes?